In the martial arts, the concept of awareness should be all encompassing; not just in our surroundings, but in ourselves. In Isshinryu karate we say, The ears must listen in all directions. This could be a metaphor that includes listening to the inner workings of our thoughts and our body. How in tune are you with your body? Most of us know the difference between good and bad pain, and this tends to be more intuitive than physiological. Anything that can compromise our longevity - such as poor health - should be regarded as inimical as any adversary. Even if we take care of ourselves; train regularly, take vitamins, and so on, we can still be at risk. In 1984, fitness guru Jim Fixx died at the age of 52 of a massive heart attack following his daily jog. Fixx was a seasoned runner who wrote a book on the subject and espoused a healthy lifestyle, but an inherited predisposition to coronary disease along with his earlier years of smoking and improper diet had finally taken their toll on him. 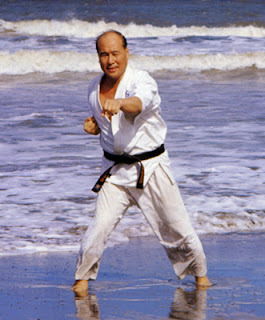 There was an instructor from my area who lived and breathed the martial arts. He'd give clinics and on occasion would show up at a couple of schools that I trained at. When it came to sparring he wasn't afraid to mix it up with anyone. An adept in a number of styles, he had a vast reserve of knowledge and I can personally attest to his fighting prowess. When he experienced chest pain he was told he needed surgery and then all should be well, but his days of heavy kumite and randori sessions would have to come to an end. Not fighting was unthinkable for this salty warrior and he failed to heed the doctor's stringent advice. One day he was invited to a ceremony at a renowned karate school to receive a lifetime achievement award for the martial arts in addition to an honorary black belt certificate. When the 46-year-old budoka stepped up to the podium to accept his citations he suddenly collapsed. The heart that served him so well in countless matches had given in. He was buried in his gi and black belt. As we grow older we naturally become more susceptible to health issues. About once a month take a full-body check to explore the possibilities of lumps or other abnormalities. Every year, a physical examination is imperative and after a certain age you will be advised (based on your family medical history) what kind of special examinations you may need. But if you feel something is amiss right now, see your doctor immediately. We all enjoy making and spending money, taking vacations, enjoying time with our families and practicing martial arts, but without our health what do we have? Every patient carries her or his own doctor inside. - Albert Schweitzer, M.D. I ignored my pain far too long (especially with the wrist injury) and now it will never be the same. Having somewhat limited use of ones dominant hand is a constant reminder to listen to what your body is telling you. Training in the Martial Arts changed my relationship to pain. There was a phase in my training where I found it hard to distinguish between pain from injury or pain from sheer physical exertion and because I was learning to ignore the latter, I found it hard to listen to the former. It has taken me some time, but now I listen to my body. In fact, I have just missed classes due to a nasty virus - in the old days I would have tried to push through it. I have been fortunate, however, in having really good instructors who have been adept at identifying problems and stopping me from training before I could really damage myself. They 'heard' what my body was saying before I did! Thanks to them, I've learned to listen too. Excellent John, this is to be heeded especially by men. I say that as we, as men, have a tendency to overlook important signs as weakness when in reality to take heed to those signs is a sign of true strength. Very well said. I just HATE going to the doctor so badly that I usually try to avoid it at all costs. Good health also means paying attention to your environment. A guy who worked with my Dad recently died at age 48 from lung cancer. He never smoked, but had a radon reading of over 300 in his housen (the norm is up to 6). I'm getting a test kit for my house this week! Man has mastered a lot of things. Mastering or being in sync with our own body is such a challenge! It's a continuous dialog between mind and body. Ouch, that hurts too much. You were wrong. "Listen to your body" has been the advice given to me since the first day that I stepped into the dojo to train. I've listened, and at times told my body "too bad, keep going" and then my body responded with a general strike. Sometimes ego, and pride caused me to regret ignoring the warning signs of my body so I learn to listen more attentively due to the consequences.